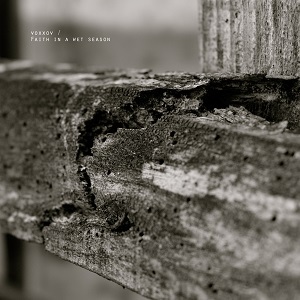 Steven Gullotta Other Alright, continuing on with the second part of this compilation from VoxxoV Records, we come across Faith In A Wet Season. Compared to Fall Is A House Of Gold And Rain, this is a much more somber phase, turning to dark ambient and drone music. Now, again, this part is a release with many artists that I don't know of, and I was once more hoping that it would mean fresh talent would turn out with fresh progress. And, well, for drone and dark ambient sounds, I was rather pleased with how the second part of this free release turned out to be. The first song, Flying South, gave us some light and simple piano work playing throughout the song, along with some clitters and clatters scooped up within the somber melody. I can really imagine someone being a sad sack, drinking wine, and smoking a cigarette to this song due to a more than stressful time in their life. Then, the next song delves straight into drone. The sound is always being occupied by more, sometimes fading, and sometimes disappearing, but constantly driving forward and moving on. It was relaxing in a way. However, I got a bit worried at this point, as Last Call, Rustles VS Muscles, Latent Hours, and Continuum sounded way too the same, the same problem I found within the first part of this compilation. But, then the dark ambient sounds and violin work of the humorously titled Several Tree Huggers Were Found Dead broke away from that mold, and delivered a solid four minute track. Enclaven really helped with the atmosphere of the album, making way for extremely moody and dark textures. I was imagining being inside a cave while listening to this song, filled with ancient carvings. Distance Kills Me and Step Inside both came out to be fairly the same song, in my opinion, at least. They were both more dark ambient works, but none really differentiated from one another. I loved the lightness of Norae, with the string instruments really creating a more mystical atmosphere. What may serve as confusion to some (and even a poor choice for the collaborators on this album to accept) is that the song Continuum appears twice. Each song is different, as it's done by two separate artists, but you'll definitely wanna stick to the later version. The looping background noise does get a bit annoying, but the slight beat and fairly soothing violin work make to sound like a heart beat. Glistering didn't do much for me, as it was just another ambient song that just did not push any boundaries and just stuck within the mold of what I would expect ambient music to be. I felt the same for Magenta, and as different and a little bit Jazzy as The Threshing Floor was, I did not appreciate it all too much. It sounded as if there was way too much going on at once to make not for a coherent sound. Alright, continuing on with the second part of this compilation from VoxxoV Records, we come across Faith In A Wet Season. Compared to Fall Is A House Of Gold And Rain, this is a much more somber phase, turning to dark ambient and drone music. Now, again, this part is a release with many artists that I don't know of, and I was once more hoping that it would mean fresh talent would turn out with fresh progress. And, well, for drone and dark ambient sounds, I was rather pleased with how the second part of this free release turned out to be. Now, as a conclusion on this two part compilation effort, what I can really summarize is that there needs to be less focus on how many artists can be fit onto a single release, but rather how much quality can be fitted onto the release. Choose ten of the thirty plus tracks on the compilation that really stick out and show what you can muscle out, rather than showing off every single piece of music that you can so thrust in our face.